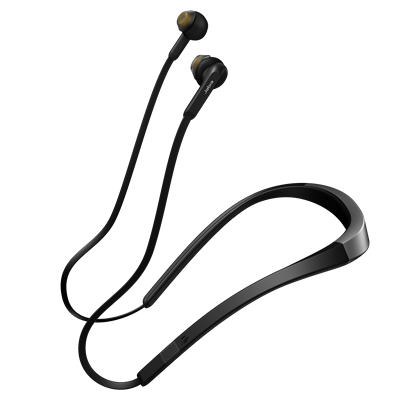 Refurbished by Jabra - 180 day warranty. The Jabra Freeway speakerphone delivers in-the-car quality audio performance - so you can keep your eyes on the road and your hands on the wheel. The Freeway turns on when you get in the car and features voice control call screening, turning your car into your private conference room. Speakerphone for the car with rich and crisp sound with 3 speakers, HD Voice Ready, Virtual Surround Sound and dual microphone background noise reduction technology. Use your voice to make and take calls completely hands-free; announces the name of the incoming caller. Up to 14 hours of talk time, up to 960 hours (40 days) of standby time, podcasts and directions from GPS applications. Advanced wireless connectivity and superior quality calls and music. 4,5 hours talk/music time in earbuds. Charging case adds additional 9 hours of battery life. Comfortable and secure cord-free fit, with option to wear one or both earbuds. Next-generation Bluetooth mono headset with 10 hours of talk time. Eliminates wind noise, so you can have clear calls even in noisy, windy conditions. Easily connect with NFC-enabled smartphones by simply tapping the two devices together. Slim design with all-day comfort. Small, discreet design incorporating microPOWER technology.Ultimate Comfort Eargel for a secure fit. Wind Noise Blackout and HD Voice for crystal clear sound at both ends of phone calls. Easy pairing to smartphones and other devices with NFC, as well as Multiuse to pair to 2 devices at the same time. 9 hours of talk time and an energy-saving PowerNap function. Noise Blackout 3.0 technology; HD Voice ready technology; spoken Caller ID, battery and connection status with Voice Guidance. Voice Guidance talks you through setup, pairing, battery and connection status. Multiuse - connect up to two active Bluetooth® devices at the same time - Transmits music, podcasts and GPS directions with A2DP technology. Mono Bluetooth headset with optimized noise cancellation for reduced background noise and excellent call clarity under any environment.